Jamaican reggae artist Beenie man is to make a live return in London after a gay pressure group dropped its protest over allegedly homophobic lyrics. The singer had to cancel concerts in the capital after the Metropolitan Police launched an inquiry into lyrics in his songs. The artist - who denied inciting homophobic violence - will play in Hackney on Saturday. He has agreed not to play songs featuring homophobic lyrics. The star, who is signed to Virgin Records, told BBC London his lyrics had been misconstrued. He said the term "batty boy" - widely perceived to be a derogatory term for a gay man - actually meant a child molester. "Jamaican people are taking our lyrics and translating them to people in the wrong way... a batty man is a child molester, anyone in Jamaica can tell you the same thing." Gay pressure group OutRage mounted a campaign against Beenie Man and several other Jamaican artists, including Sizzla and Elephant Man. It meant the acts were banned from appearing at last year's Mobo Awards in London. But now Outrage has pulled the campaign after a deal was struck last month after the artists agreed not to release songs with lyrics denigrating gays or lesbians. "There isn't going to be any more promotion of tracks that incite the killing of lesbians or gays," said Outrage spokesman Peter Tatchell. "We've suspended the campaign as an act of faith, and we hope all the artists will respect the deal and move forward and produce positive music without prejudice," he said. 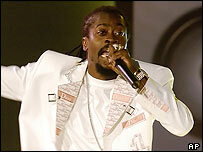 Beenie Man said he had never intended to incite violence. "A gay man is a man," he said. "It is very wrong to incite violence against anybody, any group of people... I don't do violence."